Created for the historic Masonic Lodge in Sag Harbor NY. 4 custom pendant lights that combine both antique and contemporary influence. True to "Form Following Function", the top deck houses (2) 75 watt-equivalent, LED flood lights that wash the 25 ft. ceiling with full ambient light for the room. The bottom deck features (4) 50 watt-equivalent LED spot lights which create a wide pool of illumination on the lodge floor. The middle bulb features twin lenses which diffuse the globe bulb and add a decorative visual center for the lamps. Unique custom medallions in black, gold and gray hold twin support rods. A Master Mason's "Square" with different Masonic symbols finishes the bottom of the support posts. 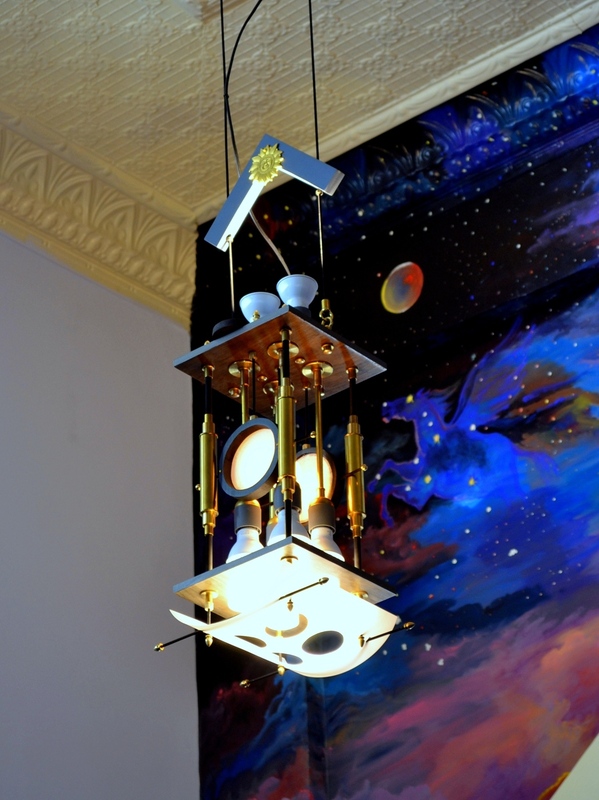 The pendants lights also have adjustable LED spotlights that illuminate the magnificent mural by Sag Harbor Artist, John Capella. Designed and entirely hand made by Art Donovan.